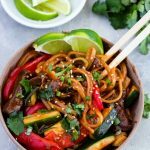 Teriyaki Beef Noodles is an amazing recipe to make in the Instant Pot. 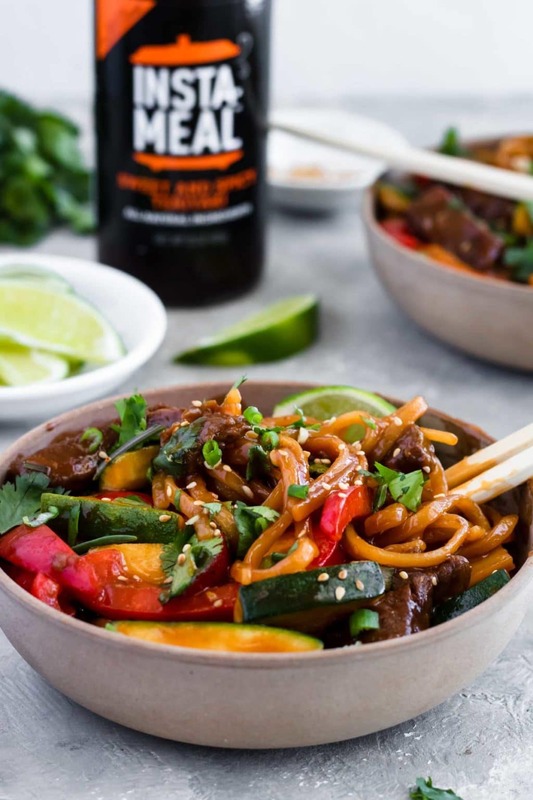 Rice noodles and tender beef are coated in an amazing Sweet & Spicy Teriyaki Sauce from Insta-Meals, then it is loaded with veggies that are cooked to tender-crisp perfection! This is a perfect Asian Instant Pot recipe to make for dinner. You will also love this recipe because it is an all-in-one pan dinner. It has your starch, protein and veggie all in one, no need to make any extra side dishes. Winning!! 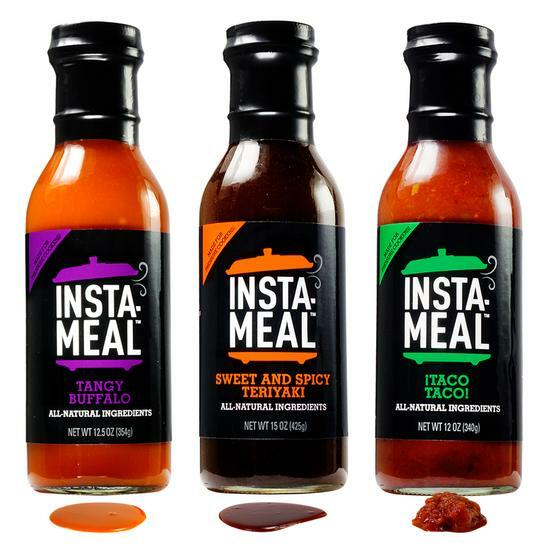 I have partnered with Insta-Meal Sauces on this post. All opinions are my own! This post also contains affiliate links. 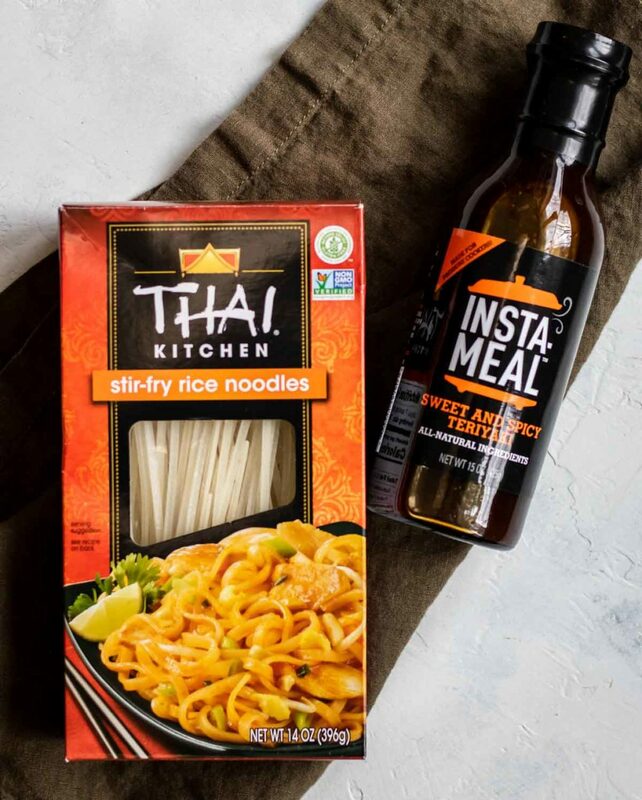 If you love to use your Instant Pot then you should definitely check out these sauces. They take the guesswork out of using sauces and liquids in your Instant Pot. They are huge time savers not only in the kitchen, but also at the grocery store. Instead of buying 7 extra ingredients to make an Instant Pot Teriyaki sauce, everything you need is already in the bottle for you! And they taste AMAZING!! 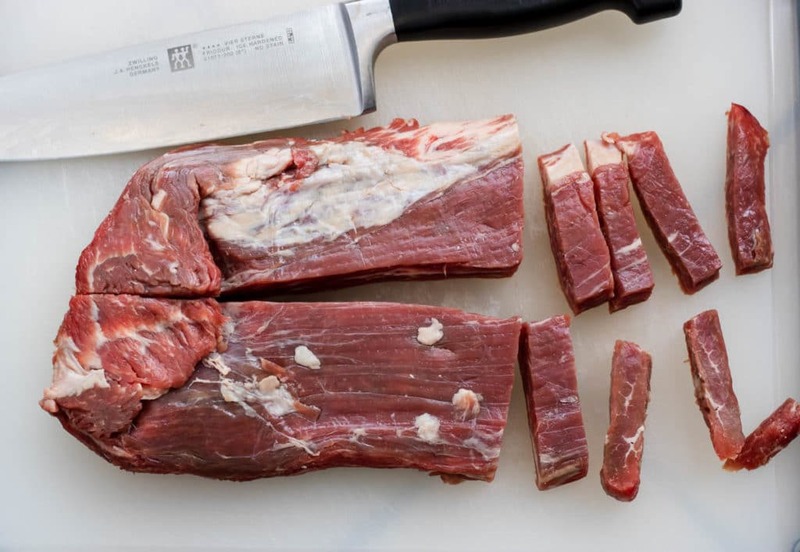 Let’s start by talking about how to cut your flank steak. This is CRUCIAL to being able to chew through your steak. Look at the steak and notice the way the grain is running (it will look like lines in the steak). It is most likely running from end to end, lengthwise. 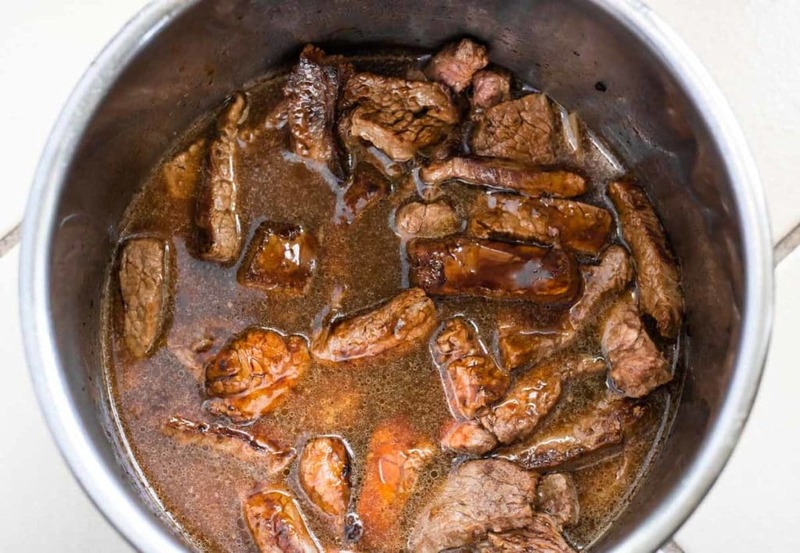 Set your Instant Pot to saute mode, once it reads HOT, add a little oil to the pot and brown the flank steak strips in 2-3 batches, so as not to crowd the pot. Deglaze the hot, empty pot by pouring all the water in and scraping up any browned bits from the bottom (keep them in there, that is flavor!). Turn off saute mode. Lightly shake the noodles into the water in the pot. Make sure not to press the noodles too hard, you do not want them to burn to the bottom of the pot. Lightly place the browned flank steak on top of the noodles, and pour the entire bottle of Insta-Meal Sweet & Spicy Teriyaki sauce over the flank steak and noodles. Place the lid on the pot and lock the pressure valve to “seal”, set to cook on pressure mode, on high, for 10 minutes. After the cooking time do a quick release of pressure. Quickly remove the lid and add in the veggies (peppers, green onions, zucchini, and water chestnuts). Give the noodles, beef, and veggies a stir and place the lid back on, turn the pressure valve to seal again. You are simply going to soften all the veggies with the remaining heat in the pot. You will NOT turn your pot back on at this point. Keep the lid on for 5-7 minutes. You may need to do another small pressure release before opening the pot again. If the sauce thickened too much you can add a little water at a time until it is the consistency you like. Garnish with lime wedges and cilantro and serve! 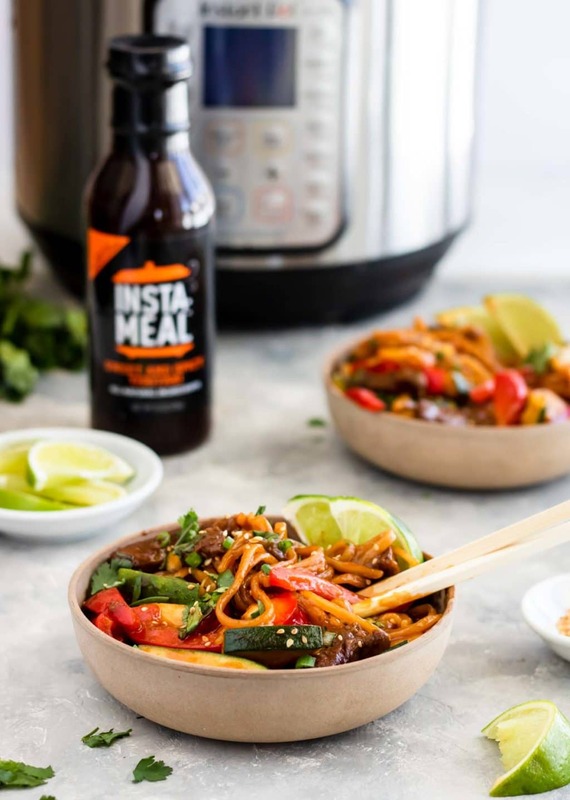 I hope you give this recipe for Instant Pot Teriyaki Beef Noodles a try in your kitchen. 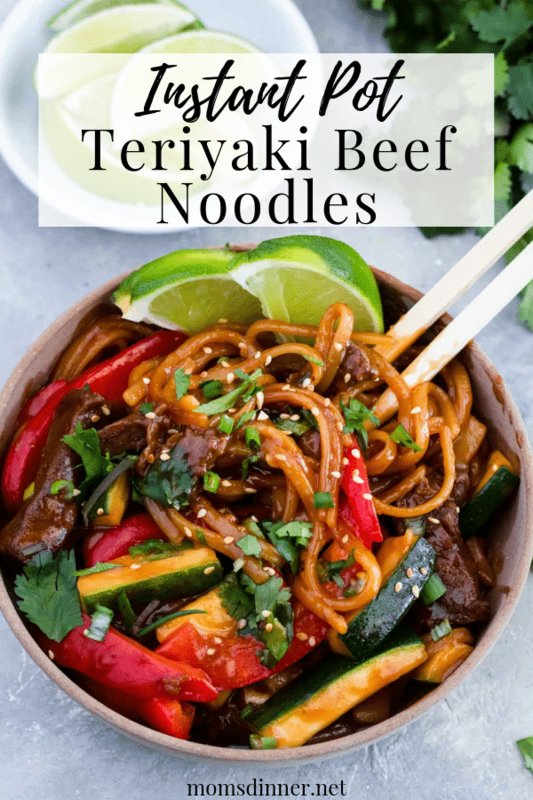 An easy recipe for Teriyaki Beef Noodles made in the Instant Pot. This Instant Pot recipe is a great one pan dinner and is ready in under 30 minutes. This is the Asian Instant Pot recipe you have been looking for. 1-1 1/2 lbs. flank steak cut in half, then cut in strips against the grain!! fresh cilantro, chopped as garnish and flavor!!!! Set the Instant Pot to saute mode, once it reads HOT, saute/brown the beef in 2-3 batches in the oil, just until browned. You do not need to cook the beef through. Add the noodles to the pot. Lightly shake the noodles so they are mostly in the water, or at least touching the water. Be careful not to PRESS the noodles too much. You do not want them to burn on the bottom of the pot! Place the browned flank steak pieces on top of the noodles. Pour the entire bottle of Sweet & Spicy Teriyaki Sauce over the beef and noodles. Place the lid on the pot and turn the pressure vent to seal. Set the Instant Pot to cook on pressure mode, on high, for 10 minutes. After the cooking time is completed, do a quick release. 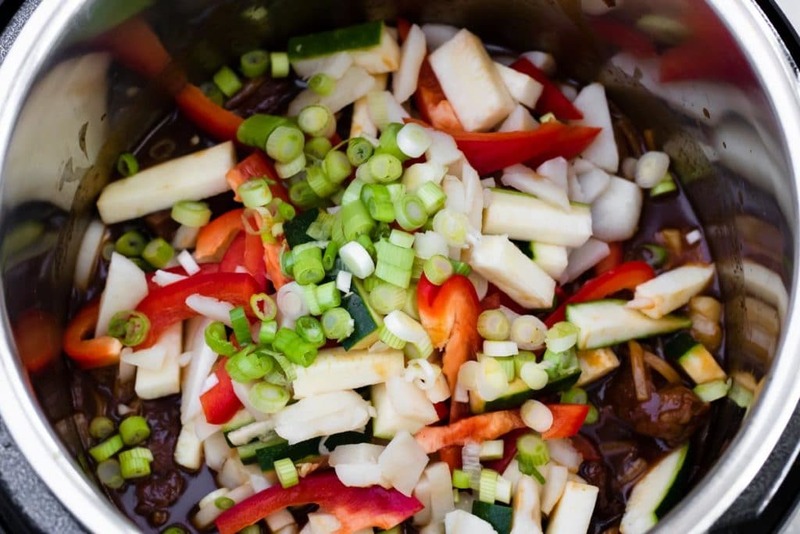 Quickly add all the veggies (peppers, zucchini, green onions, water chestnuts), and give the pot a stir. Place the lid back on the pot, close the pressure vent, letting the residual heat of the pot slightly soften the veggies for 5 minutes. You will not be turning the pot back on. You may need to do a little release of pressure to open the pot. 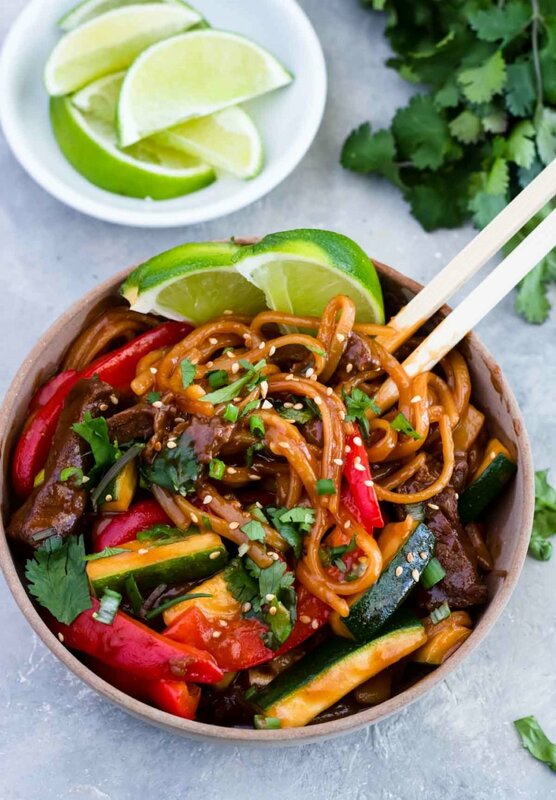 Serve the Teriyaki Beef Noodles garnished with lots of fresh cilantro, and lime wedges (if using). If the sauce thickened quite a bit during cooking, add a couple tablespoons of water to the noodles before serving, this will loosen the sauce a little. You may have a couple noodles stick or caramelize to the bottom of the pot, that is ok, just discard those few noodles before serving. To reheat leftovers- add a little water to the noodles to loosen the sauce before reheating. OMG I think i could probably eat seven bowls of this stuff. That sauce looks amazing. It is so good.. a little spicy and a little sweet! Yum!! This looks delish- love all the colors. I need to find that Tangy Buffalo sauce asap! I need to try those sauces!! This recipe is a six out if five star recipe. I could eat this for weeks in a row! YUM!